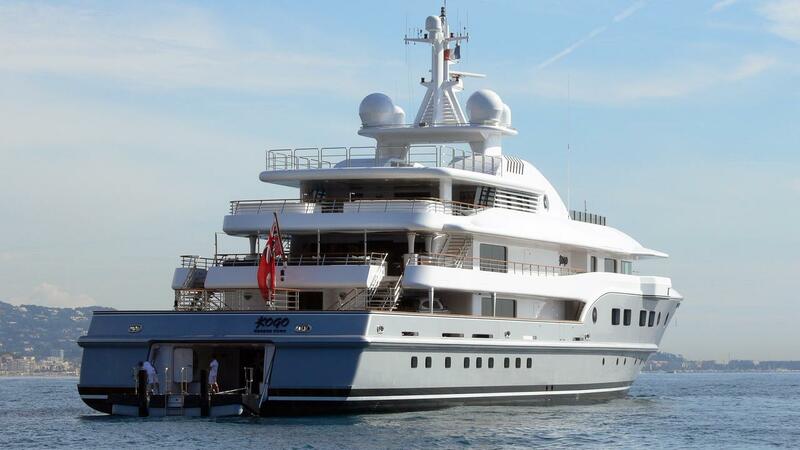 Luxury Motor Yacht KOGO is an extraordinary large superyacht which combines a striking Tim Heywood exterior design with superior construction quality. 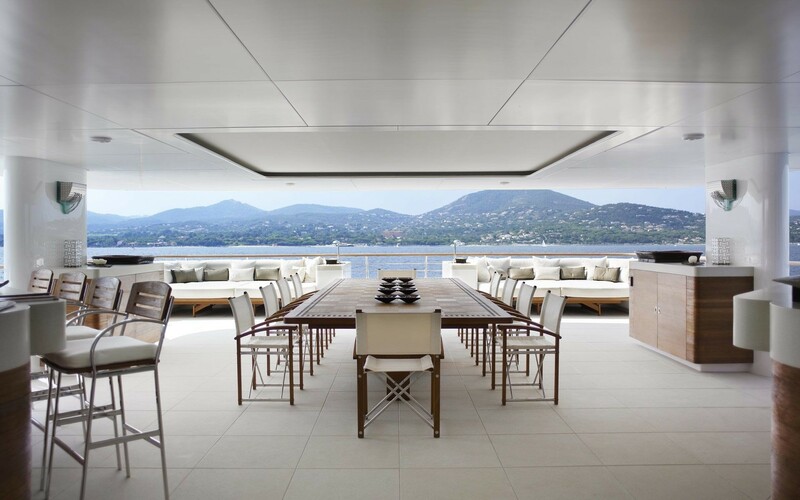 The yacht also features a wonderful Terence Disdale interior. 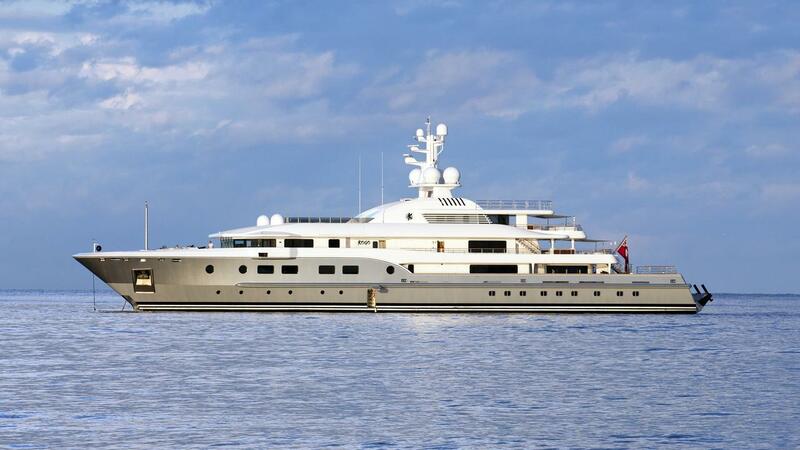 At a length of over 71 meters she has raised the standard for large luxury yachts. 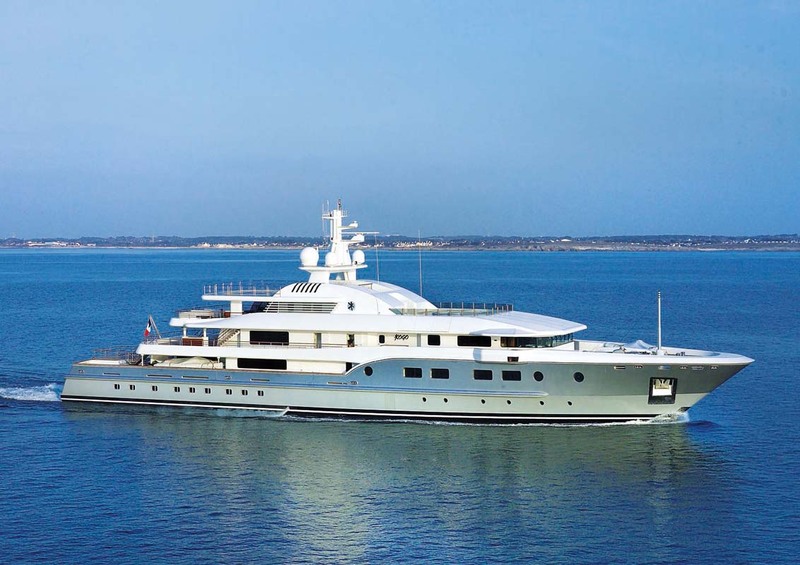 She offers luxurious accommodation for 12 charter guests in 5 luxuriously appointed double rooms and 2 twin suites. 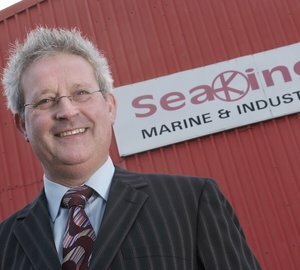 The most frequently mentioned words of inspiration for direction during the interior design meetings at Terence Disdale Design for KOGO were “Warm Sophistication”, “Zen” and “Natural Elegance”. 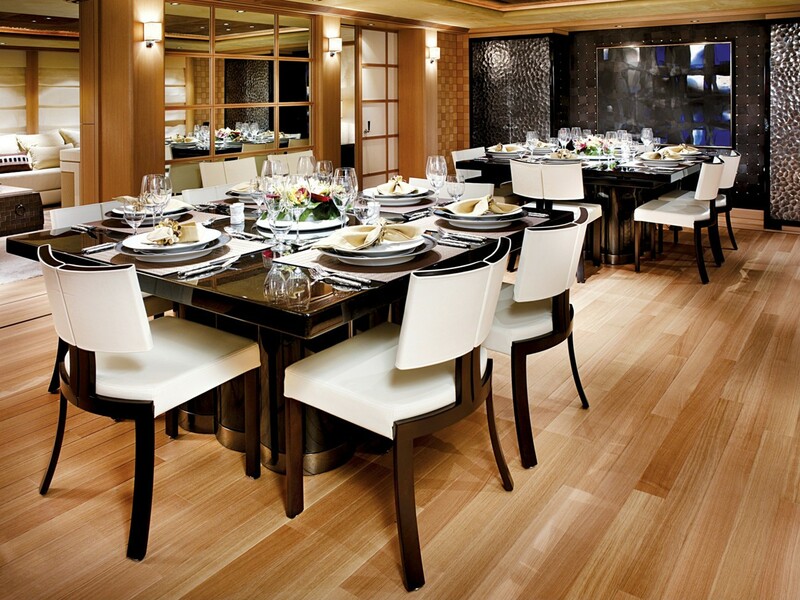 These themes run throughout the entire yacht where oriental flavours lend subtle intrigue to the many interesting finishes and textures. Coupled with the soft, warm, neutral tones, the atmosphere is one of spacious tranquility and relaxation. 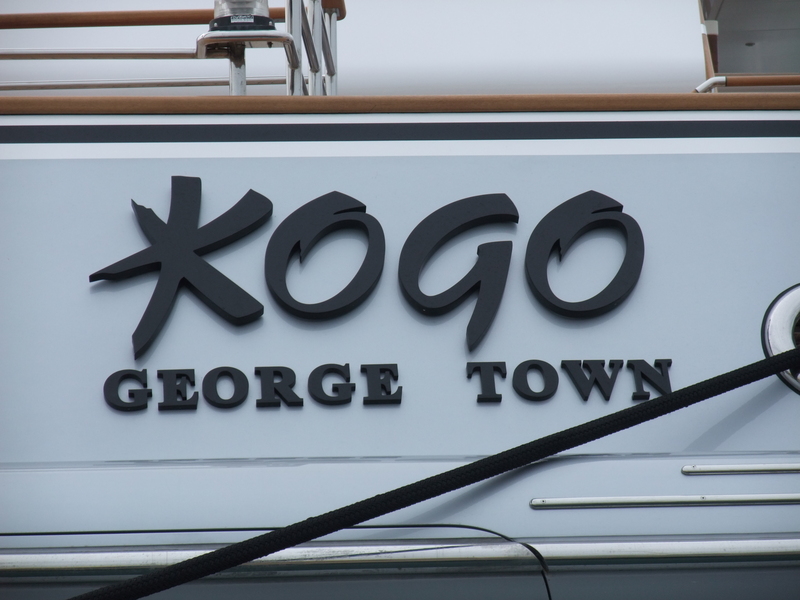 Entering KOGO from the lower deck, the professionally and fully-equipped dive room is ideally situated for guests who enjoy their water sports. Forward of the dive room lies the well equipped gymnasium and after a full workout, guests can relax in the mosaic-lined steam room directly across the lobby. There is also find the massage room where low lighting and textured, verdigris walls create the perfect environment for relaxation and pampering. 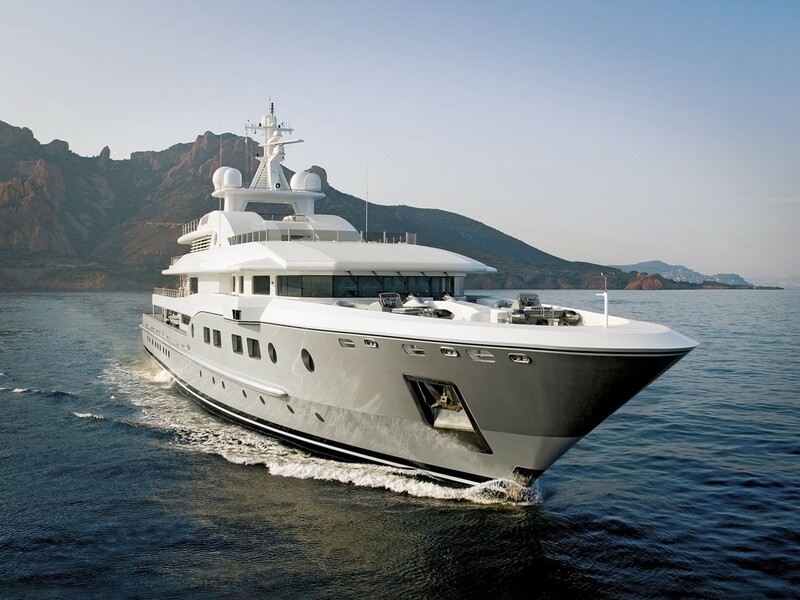 Continuing forward through the “Oriental Lobby”, four spacious, beautifully-appointed guest cabins (2 doubles, 2 twins), each with dressing areas and ensuite bathrooms, comprise the accommodation level on the lower deck. 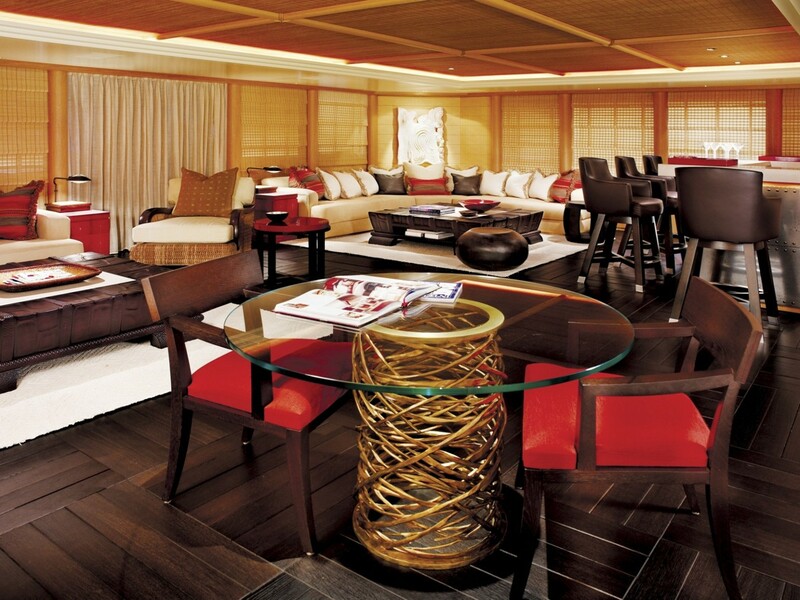 Moving up to the main deck, an inviting zen-like feel pervades KOGO’s principal living areas. The spacious main saloon with it’s enormous, inviting ‘U’ shaped sofa is perfect for both informal relaxation, where guests can lie back and enjoy the yacht’s state of the art entertainment systems, or for more formal gatherings, where guests may gather for pre-dinner drinks before proceeding to the dining room which can comfortably accommodate up to 18 guests. Large, Japanese-style sliding doors can be opened up so that these two areas will flow into one vast full beam space. Moving up again via the dramatic main stairway with its hand-carved dark wood walls, the upper deck lounge provides guests with a touch of the exotic, where dark woods contrast with crackled lacquers and shagreen furniture to give an “ethnic lodge” feel. This is a comfortable, social area where guests can truly relax, order a drink from the bar, lounge on one of the oversize plush sofas or perhaps enjoy a game of cards. 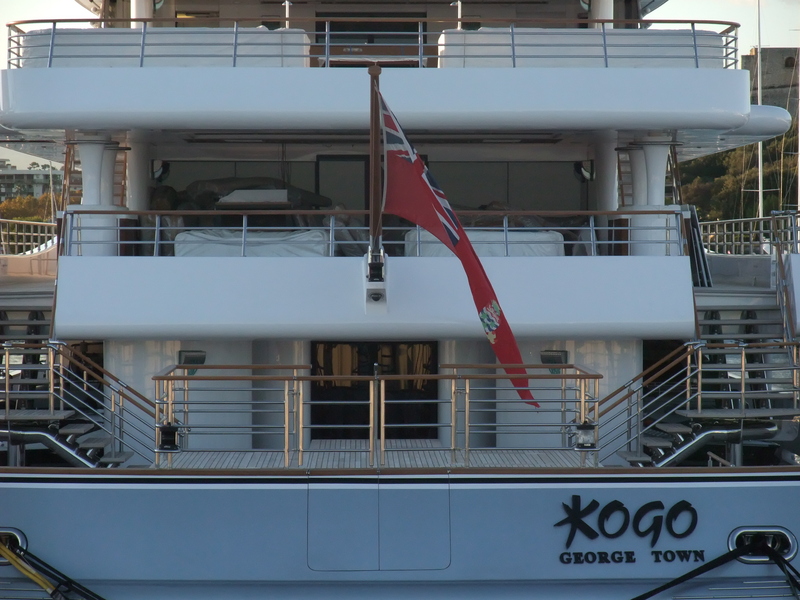 The sensational layout of KOGO's interior adds to the flow and harmony of the décor, making it easy to want to pick up anchor and sail away for a very long time. 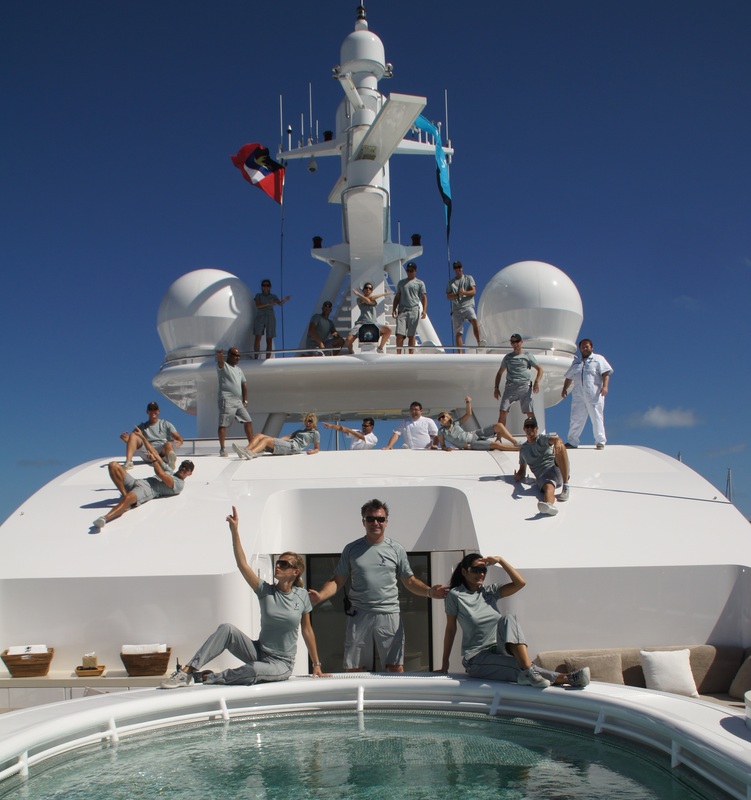 The yacht offers a wealth of exciting opportunities for even the most discerning of guests, ranging from outdoor stage / concert facilities on the upper deck to helipad, a fully equipped gym with adjacent steam room and large Spa Pool dip pool with jet stream. 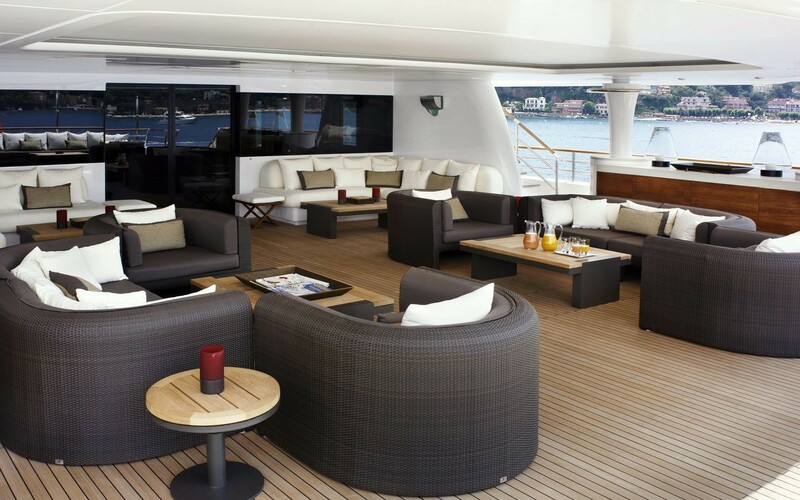 On board KOGO the stunning interiors are of course complemented by equally alluring deck spaces. 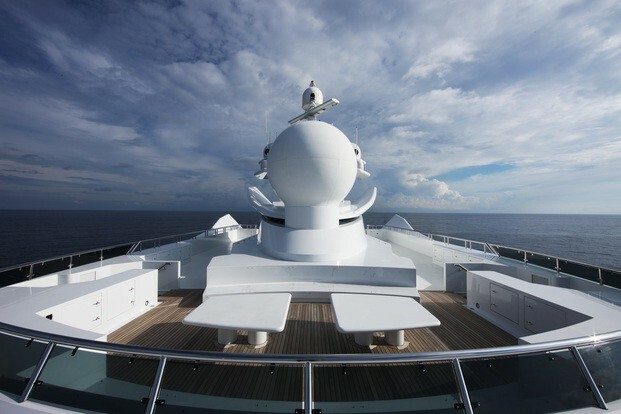 Forward on the top deck, a vast Spa Pool dip pool with jet stream is surrounded by cushions, chairs and loungers and will ensure that sun worshippers, attended to by a highly professional crew, need never leave their position before sunset. 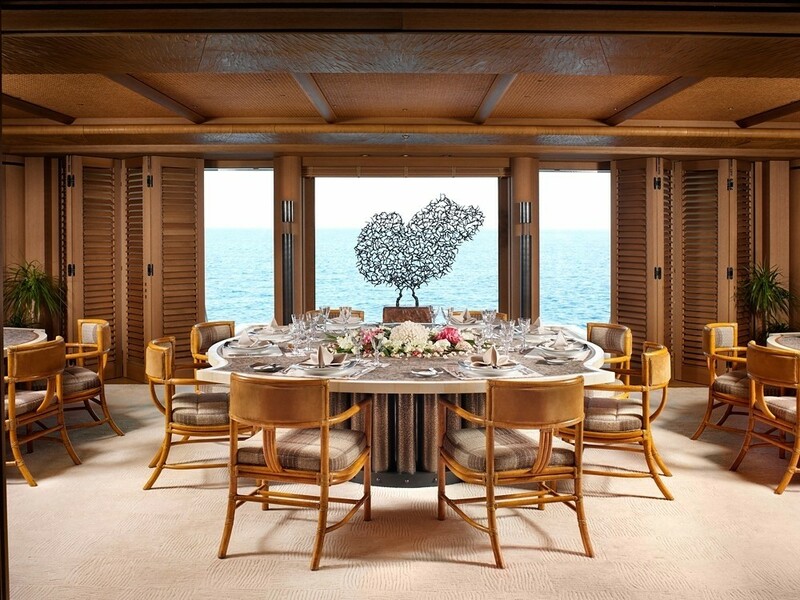 On the aft part of the top deck a round table will seat up to 18 guests in comfort for al-fresco dining and further innovative design allows for a full stage and band facilities to be set up on the aft part of the upper deck should the occasion call for it. Further opportunities for more intimate dining al fresco and relaxing are provided by alternative spaces on the outdoor decks. 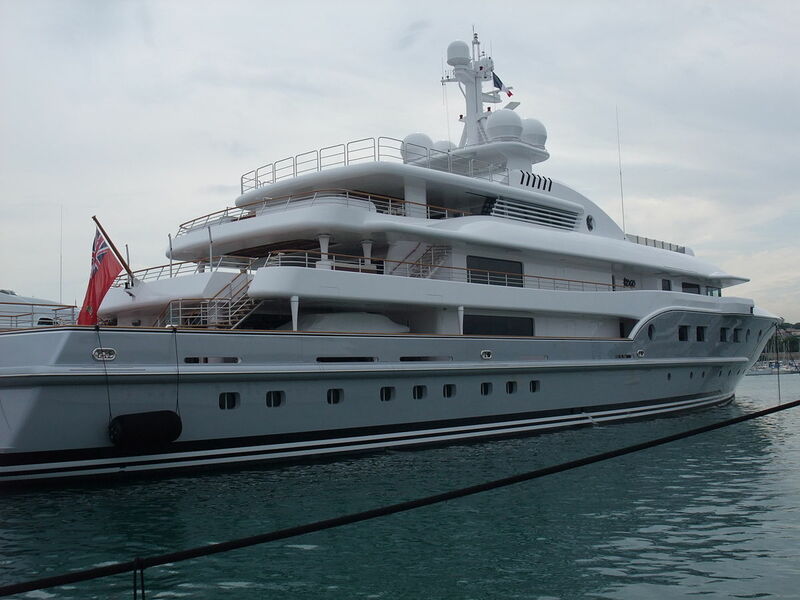 The yacht carries a full complement of water sports equipment, as befits her size, including a 7.8m fully enclosed Limo tender, 6 other tenders of varying sizes and four 2-man Kawasaki jet skis. 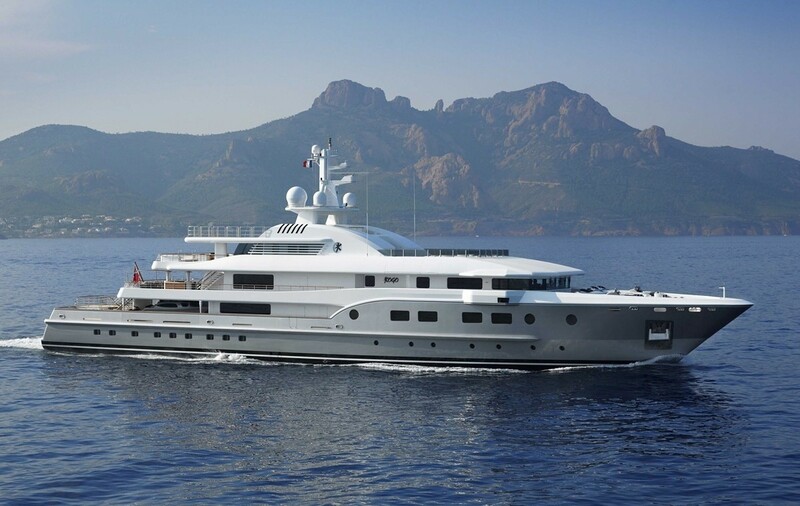 Zero speed (at anchor) stabilizers and zero movement dynamic positioning system will ensure the ultimate comfort of the party at all times. 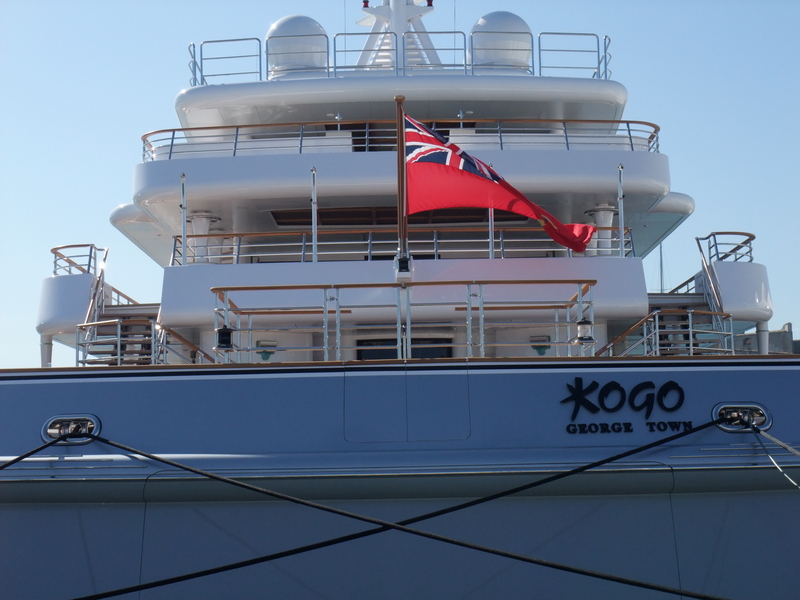 KOGO provides sumptuous accommodation for up to 12 charter guests in 7 cabins with the following layout: master suite on main deck with his and hers en suite bathrooms and dressing rooms and separate lounge / tv area. 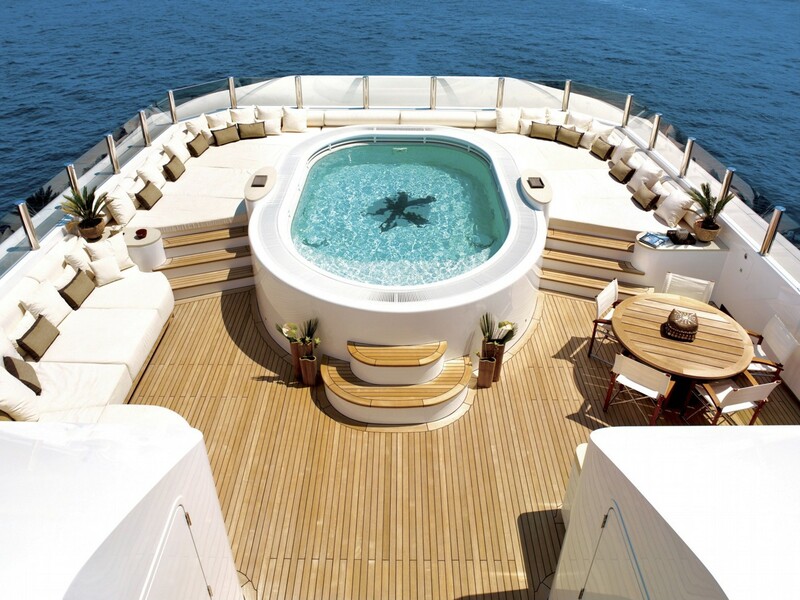 There are 2 VIP suites on the main deck and 2 further spacious doubles and 2 twins lower deck. 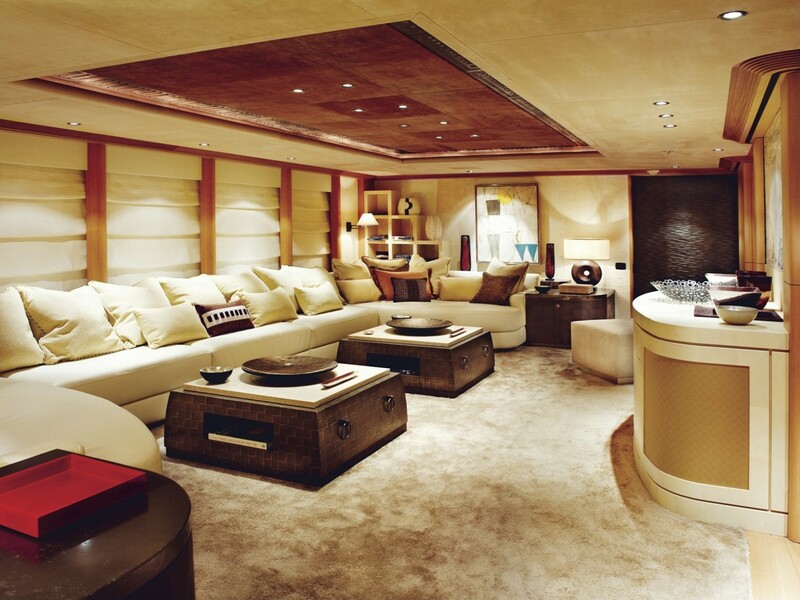 Forward of the VIP cabins lies the impressive Owner’s suite, which spans the entire beam of the yacht. 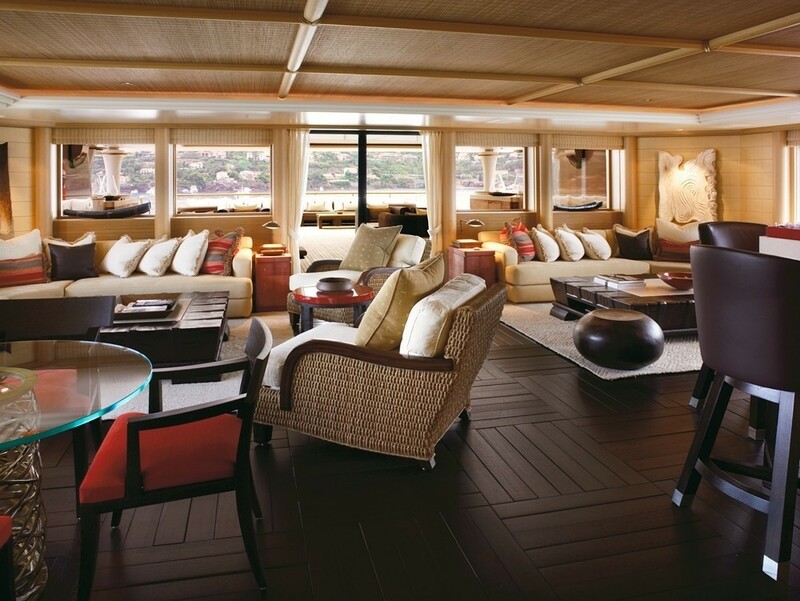 The first section of this sumptuous living area is divided between a large bedroom to starboard and the Owner’s private and very comfortable sitting room and study to port. Beyond the extensive dressing rooms, the Owner’s bathroom is divided into two very generous areas, each with individual facilities providing a private yet functional space for the occupants. 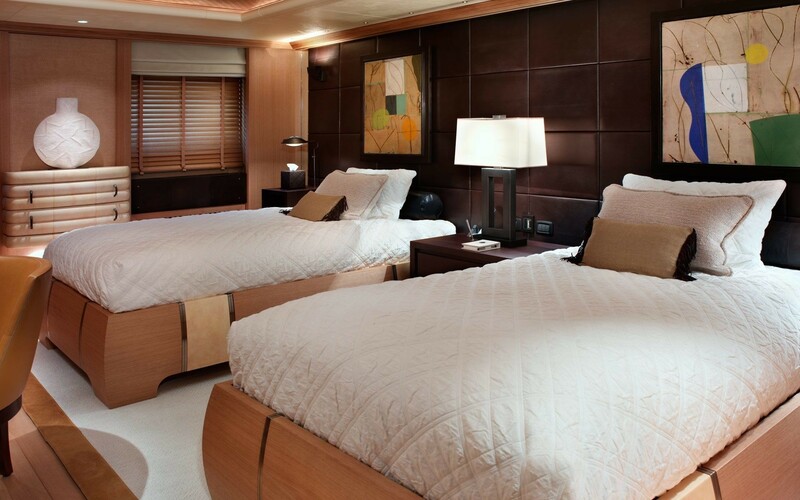 Forward on the main deck lie the two VIP cabins, each with their own walk through dressing area and ensuite bathroom. Full-size windows give these cabins a naturally light and spacious feel. Tenders & Toys 1 x 7.8m Fully enclosed Limo tender 2 x 120hp inboard/props 1 x 8.2m Rib 315hp inboard/jet 1 x 6m Rib 230hp inboard/jet 1 x 6m Rib 120hp inboard/jet 4 x Kawasaki Ultra 150. 2 person jet-skis Doughnuts, wakeboards, kneeboards, waterskis, kayaks etc. 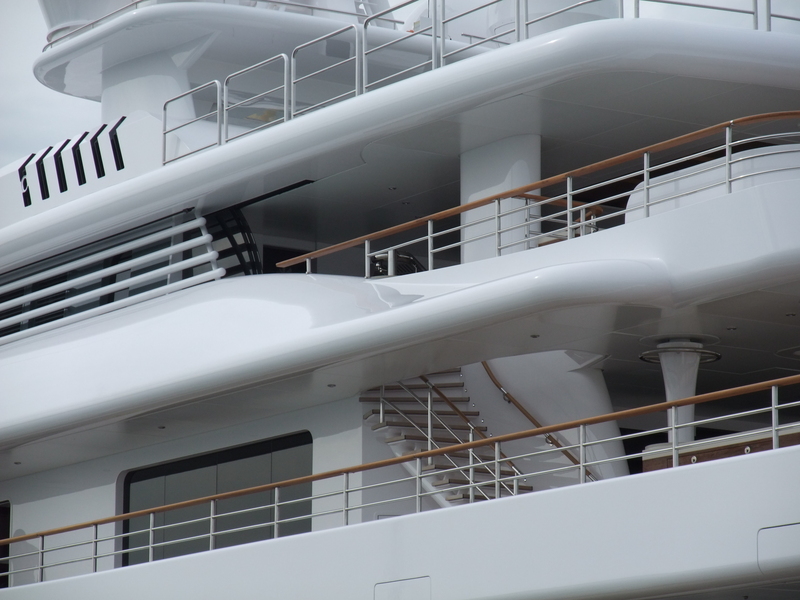 Audio Visual Equipment and Deck Facilities Plasma screens throughout and full state of the audio visual systems including out door stage / band facilities on the upper aft deck. Communications Full state of the art communications systems. Notes Full medical facilities and hospital on board Gym equipment 1 x crosstrainer 1 x recumbent bike 1 x Unica multi-gym Free weights Separate Steam room and shower adjacent to gym. 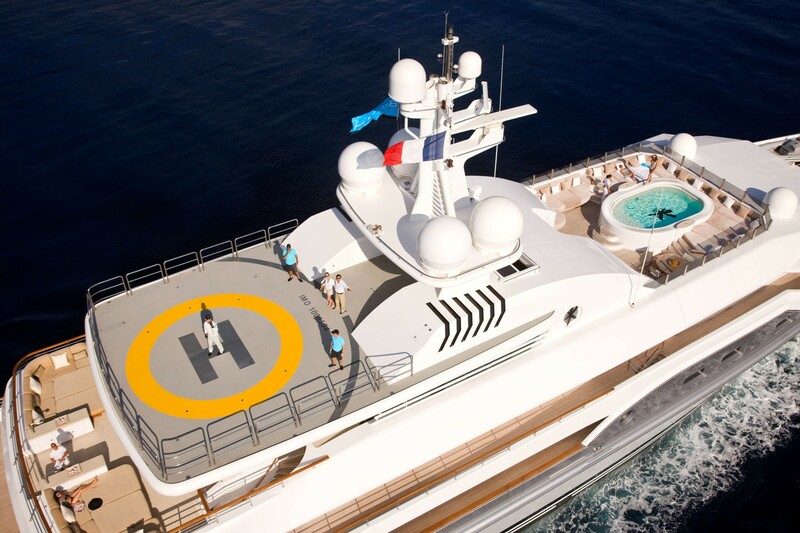 Large dip pool with spa pool and jet stream on upper deck forward with large sunpads surrounding Helicopter touch down pad Zero speed stabilizers and zero movement dynamic positioning system.